Correction: As several commenters pointed out, this chart is badly misleading in this form, as it doesn’t adjust for inflation. A corrected version can be seen here. We know the government always likes to pump lots of extra money out into the streets ahead of elections. But how’s the 2012 binge compare to the binges before recent elections? 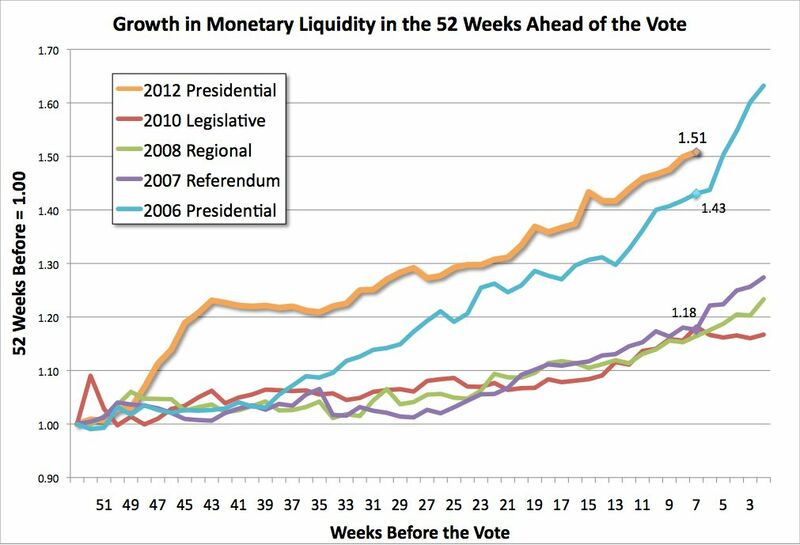 Only the 2006 liquidity splurge comes close: even so, 7 weeks ahead of the 2006 presidential election, liquidity was just 43% higher than it had been 45 weeks earlier. As for 2007, when we defeated the government in the Constitutional Reform Referendum, liquidity had grown just 18% that year at a comparable stage in the race.